Because Shanna Said So...: Get one before they are gone! It is my duty to let you in on a little secret just in case you didn't already know. Pam with ColorBlock Shop on Etsy is down to her last few candy collar necklaces. If you love this necklace as much as I do, you better get one before they are gone! I discovered ColorBlock shop from Meghan's blog, Little Girl in the Big World, back in February, and fell head over heels in love with all of the handmade neon, rhinestone jewelry. I had been searching high and low for a neon, yellow rhinestone necklace. Ann Taylor was the only store I came across that had one and it was $88. No, thank you...I could get 8 necklaces at Forever 21 for that price! So, I decided to contact Pam at ColorBlock Shop to see if she would make a custom necklace that was just yellow. And guess what? She said, YES! So, if you don't see a color on her shop that floats your boat, send her a message and let her know what you want. And, did I mention that it is half the price of the Ann Taylor one? The drive out price, with shipping was $41! Nope, that is not a typo, my friends...$41! Here is a picture of the one I got. You can also see a few pictures of me wearing it here and here. It's a beauty, right? Her earrings and bracelets are equally fabulous! And by the way, I am not getting paid or receiving FREE jewelry by writing this post. Have you purchased anything from a shop on Etsy lately? I would love to hear what you found! Cheers to a little rhinestone bling for half the price! I am also linking up with Blonde Episodes today! 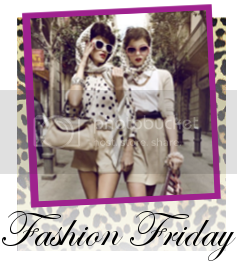 Check out more fun fashions here! wow that necklace is a summertime DREAM! Great find, I will definitely check them out! Beautiful necklace, what a great post! I've been meaning to ask you about that necklace!! LOVE it!! Thanks for the info & HAPPY FRIDAY, beautiful friend! That's SUCH a good price! Statement necklaces are so expensive, but this one is a great price! I'm going to check it out now! Thanks for the tip! That necklace is so pretty! 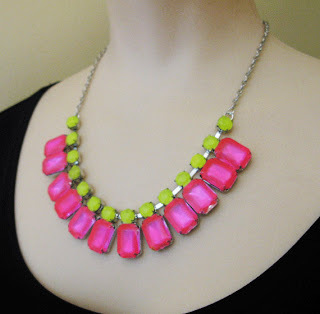 I actually had discovered this shop a few weeks ago by doing a search on Etsy for neon necklaces :) Have a great weekend, Shanna! that necklace is beautiful!!! i want one!! : ) happy friday!! Wow! The yellow necklace is amazing! So pretty and bright! So pretty! Love the neon with the diamonds!! !I found your blog through the link up of Kori, my good friend also known as blondeepisodes. I am new to this blog world and trying to make new friends in this community lol but it is not as easy as it looks :) Come check out my blog and tell me what you think! I would appreciate it! Have a great weekend. I've been obsessed with the Ann Taylor necklace, but not with the price. I'm definitely going to check out the shop! Thanks for sharing, love her jewelry! Alright, this post convinced me! Just ordered one :) thanks for sharing Shanna!! Have a great weekend. Thanks for sharing this! SUCH gorgeous pieces! Awesome pick and you got a custom necklace out of it - that's pretty rad. You could wear that to death! Hello! Love your blog!! I just wanted to invite you to come be a part of a really fun giveaway I’m having! wow, tht is so beautiful. I found a similar one on bauble bar but like Ann Taylor, it was expensive too! But you really found a gem for a good price! Off to check this etsy shop. I have never bought anything from some one's etsy shop before! Thanks for sharing! Hope you are having a wonderful day! This necklace is so fab - great find girly! Oh that is so cute!! I love seeing it in your picture. Very nice! Glad you picked one up! [url=http://www.vuittonhandbags2u.com/]louis vuitton handbags[/url], I need louis vuitton in addition to just can't hang around to get louis vuitton!! I'd been searching for Efficient [url=http://shoplouisvuitton127.webeden.co.uk]shop louis vuitton[/url] during Asia. Even so would not want to obtain good website. Now I came across this louis vuitton on the webpage. I Adore louis vuitton AND WOULD Advise TO Everyone!!!!! Your diminished version of one's Tall in height, lightweight with regards to your toes plus much more of some all of deliver louis vuitton. Attractive, very stylish. Searching for an important [url=http://louisvuittonbags127.webeden.co.uk]louis vuitton bags[/url] in order to don and produce at the dance club in addition to this variety store this is considered the louis vuitton for your requirements. I reside in chicago and we will have some tough winters but my ft remain super style in these louis vuitton!! Once we consider the term the idea of appreciate, with relation to a captivating association by using yet another, nevertheless as being a sensing that is certainly engendered once you have miltchmonkey a much better romance with yourself far too : or maybe as being a a sense greater unity with your family or human beings ( blank ) then it results in being more superior that each anyone is seeking in life is definitely like.